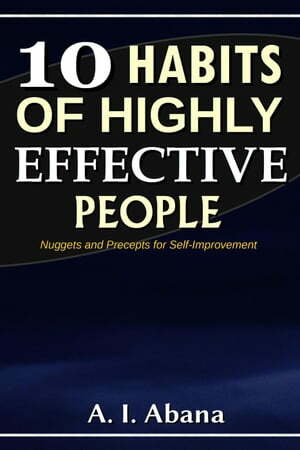 Collins Booksellers - 10 Habits of Highly Effective People by A. I. Abana, 9781386800194. Buy this book online. They set targets … they achieve them; they run a business … they succeed; they compete … they win; put them to work … they get it done! Those are things that mark effective people. It's not magic and it's not a coincidence; there are certain things these people have going for them; specific things that are behind all the performances that wow people, things that make the difference between a celebrity and a loser, things that can bring serious order and skyrocket the benefits of efforts in the life of any person who dares to have them. In this book, you are going to be taken on a journey revealing not 2, 5 or 8 habits but 10 super habits of highly effective people that can help any man or woman who has them into a success story. These habits are the secrets behind all that money some people have, these habits are the secrets behind all that fame and those victorious feats some people have achieved. Seriously, if you could get a monkey to have these habits, it would be more effective than many people. In fact, there are habits listed in this book which if a person does not have, they would be a walking dead and not know it! This book is not like others you may have seen or heard about, these habits are for your benefit and of those you care about. Don't let others inundate you with their success stories alone, it's time to let them see and hear about yours, stop being the spectator, be a star player … get this book and let these habits be a part of you.